And its peculiar charm proclaim." Garden fairies here! Whoa, we are garden fairies and we see that Alice T. A. Quackenbush has revealed some stories about flowers that may or may not involve us garden fairies. We had completely forgotten about this book she published in 1925. We are seeking legal counsel at this very moment to decide if we should let Carol tell these stories or not. We are garden fairies, always vigilant. All we can say is that Alice's stories are true, and in due time we may let Carol reveal them, but not without some compensation for us garden fairies. We are garden fairies and we have some demands. 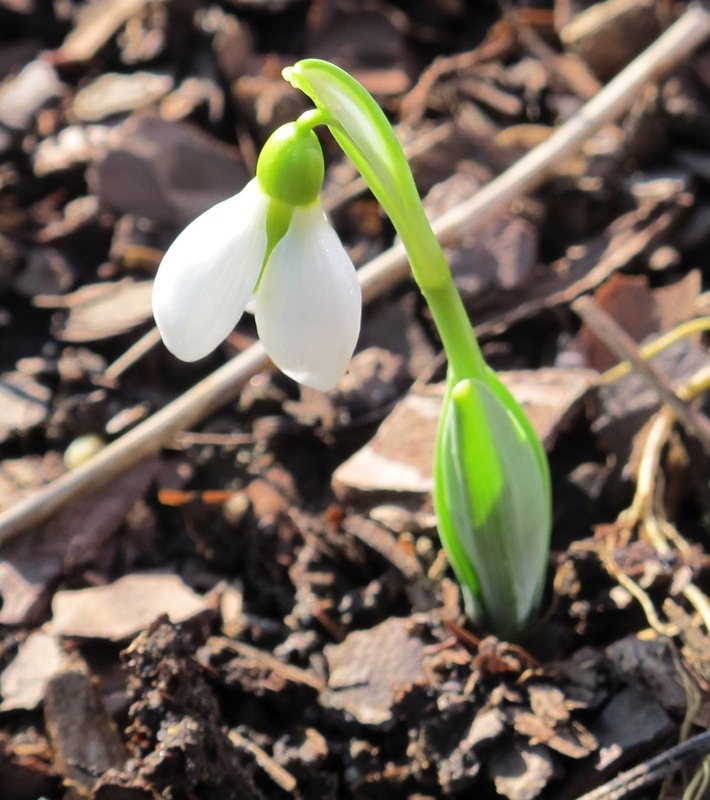 First, we want to say that the snowdrops are blooming which means... hey wait, we are garden fairies, we are not going to be tricked into revealing yet another secret that may or may not involve us. Anyway, regarding snowdrops. You know what they say. If the snowdrops are blooming and you haven't ordered your seeds yet, you are a blooming radish and way behind. Way behind. 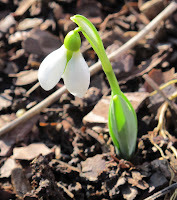 We have not seen Carol order even a single seed and the snowdrops are blooming. This means that she is a blooming radish and she is way behind. We are garden fairies, we know a seed when we see a seed, and we know a secret when we hear a secret. In due time, we'll let Carol tell the stories of the dandelions, pansies and tulips. But not until she orders her seeds for this year. We are garden fairies! Thorn Goblinfly, Chief Scribe for the Garden Fairies at May Dreams Gardens. Such exquisite prose, dear Carol and Thorn! Alice's book needs to be found and purchased so we, too, can learn the secrets of the flowers and wee folk. What? You haven't ordered your seeds yet? Don't worry. If they're all out by the time you get around to it, I ordered enough for us both. A friend has just invited me to visit the Society Library near his apartment in NYC. I'll bet I can read this book there. No snowdrops in Heath yet, just snow. And ice. Ok..SO I was just thinking I need to be ordering seeds. But I have not and yes I have early bulbs in bloom. I am orginally from Columbus Indiana, so I really enjoy your Hoosier Blog!